Food & Wine magazine today announced their 2011 “Best New Chefs” , recognizing up-and-coming chefs nationwide. Seattle has scored again with one of its own: Jason Franey, executive chef at Canlis. While the win is news to us, it’s old news to Franey, who got the word a month ago. 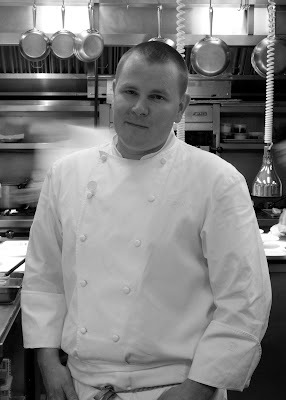 Jason Franey, in the kitchen at Canlis. Franey was also a regional winner of Food & Wine’s new “People’s Choice Award” offered for the first time this year and announced last month. He beat out a tough and talented field of contenders before he was crowned Best New Chef Northwest. Of course, he had help with that one. 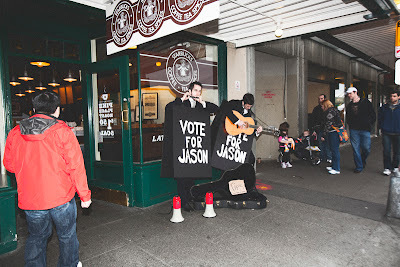 Mark and Brian Canlis, on the campaign trail for Franey at Pike Place Market. Franey’s face will appear on Food & Wine’s June cover, and he’ll also join the best-chef crew at the annual Food & Wine Classic in Aspen. But today he’s busy doing the voodoo that F&B’s Best New Chefs always do: including this morning’s big photo-shoot for the magazine. After a late-night celebration at Eleven Madison Park, where Franey worked as executive sous-chef before being recruited by Canlis in 2008, he awoke to catch a cab — only to arrive late and out of breath for the beauty-shot. His excuse? Blame it on the taxi driver. Indeed, Franey’s in good company, both locally and nationally. Seattle’s had a great string of Food & Wine cover-boys (and girls) over the past decade, all of whom continue to make a name for themselves in Seattle today. Food & Wine offers up some fun profiles of those winners, linked here: Jason Stratton (2010), Mark Fuller (2009), Ethan Stowell (2008), Matt Dillon (2007), Jason Wilson (2006), Maria Hines (2005) and Johnathan Sundstrom (2001). Prior “Best New Chefs” include Danielle Custer (1998) and Tamara Murphy (1994).